Line from the film: "People survived Hiroshima. 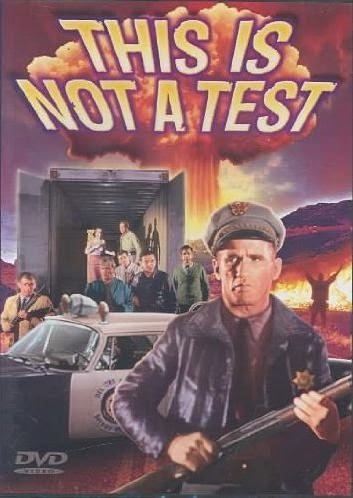 We can survive this"
Produced at the height of the Cold War, This is Not a Test tells the story of a group of people who learn that a nuclear missile is heading their way, giving them less than an hour to deal with the fact that life as they know it is coming to an end. While patrolling a lonely stretch of highway in the middle of the night, deputy sheriff Dan Colter (Seamon Glass) receives an urgent message from headquarters telling him to set up an immediate road block. The first vehicle he stops is a pick-up driven by Jacob Saunders (Thayer Roberts), an elderly man who was heading home with by his adult granddaughter, Juney (Aubrey Martin). Before long, more people happen by, including Joe (Mike Green), a beatnik who recently struck it rich, and his hard-drinking girlfriend Cheryl (Mary Morlas); Al Weston (Alan Austin), driving a delivery truck; and Sam and Karen Barnes (Norman Winston and Carol Kent), a married couple on their way to the airport. Initially, the group believes the roadblock had something to do with Clint Delany (Ron Starr), a hitchhiker Al picked up who, it turns out, is wanted for murder. But then a call comes over the radio saying the city is being evacuated in advance of a nuclear strike, set to occur in about 60 minutes. Realizing they need a safe place to hide when the missile hits, officer Colter decides to transform the delivery truck into a makeshift bomb shelter, but as the group works to clear it out, many wonder if the truck is indeed durable enough to survive such a tremendous blast. Shot in a single location in black and white, This is Not a Test feels like an extended episode of a TV series (think Twilight Zone or The Outer Limits), yet despite being a low-budget affair, director Fredric Gadette squeezes as much tension as he can out of the story by focusing on his characters, all of whom have their own way of dealing with the end of the world (Cheryl gets drunk, while Karen Barnes, clearly unhappy in her marriage, has a romantic tryst with the truck driver, Al). Along with the revelation that the bomb is on its way, the group has the added anxiety of knowing a murderer is lurking nearby (when first approached by officer Colter, Clint Delany bolted into the surrounding hills, leaving behind his suitcase). For the most part, the performances in This is Not a Test are quite good (the exception being Seamon Glass, who doesn’t appear comfortable playing the hard-nosed cop), and for being so dialogue-heavy, the film never loses any steam, remaining just as intense in its tumultuous last act as it was in the first. A taut, well-constructed character study of people forced into a seemingly hopeless situation, This is Not a Test proves a satisfying, albeit depressing, motion picture experience. THIS IS A PUBLIC DOMAIN TRAILER! NO LEGAL REASON TO REMOVE!